I Came, I Saw, ...I iPhoned!? I am writing this to express my concerns regarding this iPhone phenomena. I don't know what this Steve Jobs fellow is up to, but it is deeply worrisome that he has taken it upon himself to place his "i" in front of a traditional part of speech--the intransitive verb. The implications for the English language may prove catastrophic. Which verb will be next to succumb to Mr. Jobs's caprice? Will there be a time in the not-to-distant future when we are forced to respond with "I iwalk" or "I idrive" when a coworker asks us how we get to work? And which part of speech will be next to fall? The adjective? The adverb? The conjunction? Is this all symptomatic of our current generation's fascination with the individual--the subject "I"? I harbored no ill will when his "i" preceded "Mac" or when the iPod became an icon of a tech-savvy new era. But something now seems amiss. Agreed? So, there you have it. In the past week we've discussed a number of ways to get that old dinosaur computer off your desk and replaced with a late-model 21st century system. If you've tried any of these methods and succeeded be sure to let us know. In later, more advanced levels of Faking Smart! we'll show you how to get rid of your computer all together ...and your desk and office, too! Until then, be satisfied that you've faked smart and indulge yourself in your new office tool and the status it is sure to bestow. Remember, keep the knowledge that you are faking smart hidden from your coworkers and boss. The simple fact that they might see you as a practitioner of such a ground-shaking job-advancement system would unjustly complicate your office life and discolor, in rumor and hearsay, the true nature of this program and ultimately the work you've been hired to do. Faking Smart! is only as effective as you desire to make it, so be judicious in its practice. I've mentioned a few methods of protesting against your old computer on Monday's post. Here, now, is the last method I'll bring up ...the last and most powerful method developed by our office strategies team at the FSRI. Before you go into work on the day of this protest go out and purchase an old electric typewriter, circa 1960 ...the kind with the hard-shelled carrying case. You may find such a machine at a second hand store or you may have luck buying it through one of the many inter-web sales portals. When you arrive at work push your computer keyboard away with an expression of disgust, then drop your imposing piece of luggage in front of you, pop the releases and unfurl the power cord. Find a suitable outlet and then turn it on. 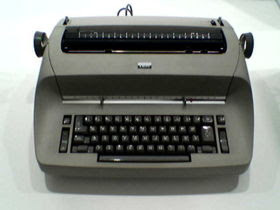 After powering up your typewriter load a clean sheet of paper and begin your work. The loud "clat, clat, clatter" from this old-school novelty will quickly draw attention and co-workers are sure to be intrigued by this powerful means of producing print. Once word spreads of the "wizardry" going on at your desk your boss's curiosity will be piqued. When she comes to investigate the cause of the disruption and discovers that you're not using your computer, simply state that boot-up time for the typewriter is instantaneous and that it's operating system is lighter and considerably faster than the old system you've been given. In short, manual type beats the sluggishness of your old, rusty PC. She'll get the message! There may be a short wait while IT gets the order to deliver a new system to your desk. In the meantime, enjoy using this dandy old implement and revel in the by-gone days when everyone had such a contraption perched on their desk. WARNING: Do not attempt to send or receive email when using this devise. Also, any attempt at downloading or viewing videos while using an electric typewriter may result in company-wide system malfunctions. Be considerate of its limitations and cautious of misuse. I am delaying the next article on protesting against your computer to address a comment made to the "Pulling the Plug on Your PC II" post. This concern with "toughbooks" is new to me, but hardly surprising. When I brought the topic up with our VP of Acid Dynamics at the FSRI labs they were well aware of the issue and familiar with the above mentioned procedure but precluded it as a viable means of doing away with a laptop. The results of their tests indicated that if you don't live in proximity to a darkened woodlot and don't have access to industrial grade containment tanks this method of destroying your toughbook became prohibitive. Lugging an 80 gallon lead-lined tank up an apartment elevator (or stairs) was disruptive to other tenants and it proved odorous to neighbors and dangerous to pets. In other words, ...don't practice this method if you live in a downtown efficiency. A better approach to the "toughbook" problem may, unfortunately, be this: If you have a job where you a given an old, low-powered toughbook to travel with, promptly resign and seek employment elsewhere. (It may be best to avoid the issue all together.) If this is difficult, or if you need to keep your job, try one of the protesting methods to get a better computer. Another thing, ...although toughbooks are, by design, slow and unwieldy, technology seems to be catching up to this menace of the jet-set business traveler. The FSRI labs inform me that a 256k RAM toughbook will hit the market early in 2013. If various attempts at destroying your computer hasn't produced the desired results, or if putting a violent end to and unthinking plastic box is contrary to your pacifist nature, staging a protest may be the very thing that gets your boss's attention and gets you the computer you need. 1. THE SIT-IN: When you arrive at work today write this message out with a Sharpie in large print on a 8x11 inch clean sheet of paper: "I REFUSE TO BE ABUSED WORKING WITH UNDER 2GIG OF RAM." Tape this sheet of paper to your display and then sit down on the floor, legs crossed and arms folded. Do not say a word. If asked what you are doing simply point to the message on your screen. Bring bottled water and some energy bars because you may find yourself on the floor for several hours. 2. THE PETITION: Get as many people as possible to sign a petition in support of your getting a new computer at work. Go door-to-door in your neighborhood. Go to your county fair with a clip-board and get the word out. Create a website and state your grievances to the public and ask for email addresses of supporters. Finally, get the signatures of your coworkers and even signatures of people in businesses near you. You might even try to get executives from your own company to join in your petition. When you've collected 10,000 signatures ask your boss for a "quick" meeting and drop the bundle of signatures on his or her desk. This sends a powerful message that your talents are being under-served and you shouldn't be surprised if a new computer arrives at your desk that same day. 3. THE CONGRESSIONAL APPEAL: Write a letter to your national congressional representative or senator with the details of your plight. Mention how your great, great uncle fought for his country in the Spanish-American war, or mention your aunts "national service" in the Peace Corps and then press the official for quick action regarding your case. One additional method of protesting will be published on tomorrow's post. So don't go out and try the methods above just yet. Destroying your computer, or "computer euthanasia" as it is sometimes called, is a controversial subject. There are many who are against the practice on ethical grounds, that to take a computer's life is simply immoral. It makes no difference how old and clunky its hard drive sounds, how severe its pixel drop-out is on the display or how bogged-down it is with viruses. To take the life of a computer, they argue, is wrong. The FSRI believes otherwise. Business is cut-throat these days and to get ahead you have to fake smart, and to successfully fake smart you need the best and latest tools at your disposal. It doesn't matter how much you know about your new, high-powered system ...the fact that you use it says everything. Therefore, you have to "git 'er done" and bring the ax down on your old, limping PC. Her are six ways to put an end to the albatross that is constricting your chances for success in business. 1. Buy a rubber mouse. Place it behind you (when no one is looking), then notice it with a scream and throw your computer on it. Use enough force to break your computer. 2. Bring a bowling ball to work to show your co-workers and boss. When back at your desk or cubical act surprised when somebody speaks to you and drop the ball on your computer. 4. Eat a chocolate bar ...after it has been sitting on a hot place on your computer or near your desk. Then handle your computer while unwittingly smearing the chocolate all over it. After this, remove your computer with haste and approach the nearest stairwell where you will then throw it down the stairs. If asked about your actions claim that you were bringing it to the bathroom to clean it. 5. Viruses are apparently devastating to a computer system. If you happen to have contracted a severe cold or flu ...DON'T CALL IN SICK AND STAY HOME. Come to work (preferably with a high fever) and cough and sneeze as much as possible on your system. 6. Eat lunch at a Mexican restaurant and bring your leftovers back to work with you. Then take a CD, dip it in your salsa or refried bean dip and place it into the disc drive. If asked why you did this explain where you ate lunch and say that you "just weren't thinking." This may ruin your CD drive, but it may be enough for a complete system replacement. Remember: it's not your fault if you ruin your computer. A computer is, as described, simply a human tool. And tools are only as good as the user wants to use them. If there are any other ways to destroy a computer while at work please notify the FSRI or comment on this post. We would be glad to hear any new suggestions that haven't been developed in our labs. Your computer works just fine for what it's needed for. It has just enough juice to access company databases, run your email application and load a web-page when pressed. It's like driving a '93 Ford Taurus: it burns a little oil and has an exhaust leak, but it gets you where you need to go. For many this is enough ...but for the employee trying to fake smart your stone-age operating system is an anathema--and embarrassment to you and should be to the company you work for. As far as the FSRI is concerned, you have three options to solve this problem. The first is to stay the course--don't make any waves and hope your system gets upgraded after some time has passed. Your second option is to quit your job and apply at a firm that has better computers. Your last option is make it necessary that your computer be replaced. If you decided to "stay the course" the FSRI has determined that you chances of impressing your workplace by faking smart are drastically diminished. If you choose the second route you subject yourself to the caprice of a wily job market. If you go with the third option, however, the FSRI has devised a number of ways to get a fast, up-to-date system on your desk within one or two days. Computer Euthanasia--coming in the next post. Advice on "protesting your current predicament" will follow. At our present understanding your work computer serves one sole function: to make you appear busy and productive. Without it you would come off as lazy, if not "frozen", unable to send and receive email, accidentally delete files, play solitaire, update your calendar or log onto the interweb to find movie reviews, sport scores or to follow the developments of your favorite blogs. In essence you would become a zombie, incapable of modern communication and a drag on company payroll. 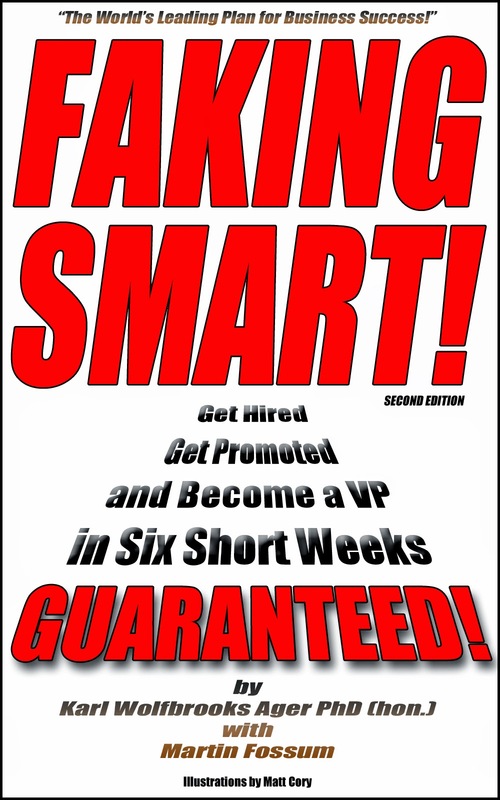 To succeed at work and to flourish at Faking Smart! it is imperative, not only that you have a computer, but that you have the latest, top-of-the-line system in to maximize your ability to appear busy and productive and to maximize the good impression you make on your co-workers, and most importantly, your boss. "So, how do I get the latest, top-of-the-line computer out of my boss and company?" 1. The request: ask your boss if you can get a better computer. This may surprise him or her, and you may not be taken seriously, but it's worth a try. If your request goes through and you are awarded a new system it may still take several months for the paperwork to go through and several months before you actually see a new computer sitting on your desk. If it looks like it will take a long time to get a computer through direct request try moving to the next method. 2. Require that you computer be replaced. This is achieved by damaging or destroying your current computer system. If, after having your antiquated system ruined beyond repair, you are given a "new" computer that is the same as your old one, you may have to exercise this method more than once to get your desired upgrade. If after several attempts to get a new system through this second method you still find yourself with the same run-of-the-mill computer, proceed to the fail-safe method three. 3. Protest your current predicament. The visible despair you convey to everyone at your workplace, that your current computer is so completely inadequate that it borders on notification of Amnesty International, will warrant that your situation find quick review by your superiors. The FSRI has done thorough research on the "protest" method of getting a new computer. This method should be used only in the most dire of situations. A detailed description of these three methods will come with later posts. Until then evaluate your current condition and see where you stand. So you've got your cup of coffee, chatted up the boss and you're ready to sit down, turn on your computer and get to work. These are the rituals you go through every day as a modern business employee ...but did you ever stop to wonder just what this strange machine is that is sitting in front of you, begging for your utmost attention? You may not realize it but computers haven't been around the modern business office forever. No. In fact, computers, as we know them, (...and not including the abacus) have only been a workplace mainstay for only the last ten years or so ...ever since a bright young advertising executive in a San Francisco firm brought one in as a cumbersome yet functioning paperweight. The rest was history. Today, thanks to advances in technology, computers are to be found in nearly every office in all parts of the world, helping to make employees appear busy and productive. This week we explore the uses of the computer and the way they can assist you in your quest for Faking Smart! "It's not what you say," I always note, "but how you say it." Put yourself to the test and compose an email that uses all these words at once! Whenever you attend a business meeting in Paris I suggest that you wear a black and white striped shirt (horizontal stripes) and a beret tilted slightly on you head. To complete this ensemble tuck a freshly baked baguette under one arm and watch as eyes widen with surprise when you enter the room. There is a good chance that you will be regarded, there and then, as a born and bred Parisian and not the unwitting foreigner they expected. Your presentations will attract more attention and your networking will reap surprising rewards. Remember: you may want to practice this "look" in your hotel room before incorporating it at a business function. Also, you may want to practice using an accordion and a monkey if the baguette idea seems too trite. Q: I have an interview next Tuesday. Should I wear a pin-striped tie or a floral print tie? K.W.A. : I have three questions for you: first, do you like flowers? ; second, does your shirt have a collar (..can it accomodate a tie? ); third, do you know how to tie a tie? If you answered "no" to any of these questions then go with the pin-striped tie. Personally, I would recommend an ascot to really make a bold statement, but this is hard to pull off. You have to have to be extremely dignified for this look to work. This blog was invented by K.W.A. and the FSRI to answer random questions about corporate America. If you have a question (any question) regarding corporate America, getting a job or anything to do with business please view KWA's profile and send an email. Selected questions will be answered through these posts ...depending on whether or not K.W.A. has the time to answer them. It is very difficult to reach K.W.A. and the FSRI has come up with this solution to try make K.W.A. and his enormous breadth of knowledge accessible to all. Good luck!, and keep Faking Smart!